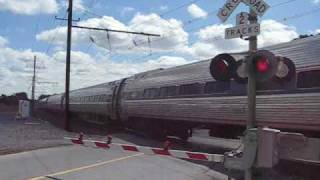 It is an extreme rarity to find Amtrak's Dash-8 units leading the Pennsylvanian, and even more of a rarity to see them do 80 MPH under the wires! The first shot takes place out in the beautiful fields and farm lands at the base of Tuscarora mountain along the Norfolk Southern Pittsburgh Line. 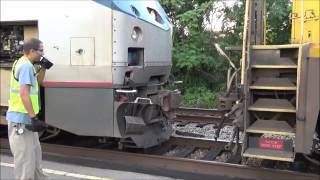 August 13, 2012, Amtrak 43, or 07T on NS, heads west with 513 as the sole unit. Unfortunately, the clouds rolled in, but it was still a nice treat to a massive photo-line who were trekking their way west for NKP 765. The next day, we see it return on the eastbound 42 at the Irishtown Road crossing between Gordonville and Ronks. Here, it reaches about 90 MPH, and, as is usual tradition if both trains are relatively on time, a perfect meet with the 43 with P42DC 190! This is where two cameras would have helped! Oh well, enjoy!!! Also, there are a few Keystone trains at the end as an added bonus for your entertainment! Aren't active mainline are supposed to have concrete grade crossing? Not street pavement? I don't know of any law anywhere that requires that, not in Pennsylvania at least. Shout out to the UPS driver for waiting safely and patiently behind the crossing gates for both trains. These trains lead on 2 yards. 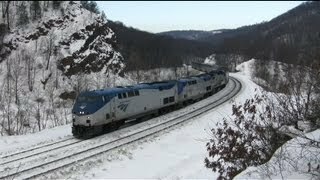 Amtrak P32 #513 train leads coach class cars on Mexico, PA.
Another amtrak P32 #513 train leads coach class cars at Irishtown, PA. AMTK P42DC #190 train leads coach class cars at Irishtown, PA during Keystone Corridor at storm. 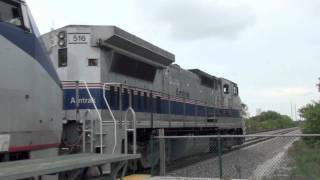 AMTK AEM-7 #944 train at Irishtown, PA leading coach class cars with a cab car ending. Amtrak cabc ar train leads coach class cars with a Amtrak AEM-7 #947 train ending at Witmer, PA under the highway bridge. 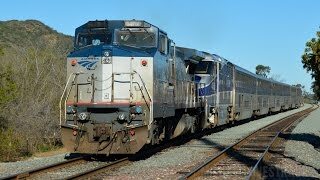 Why is Amtrak using polluting diesel engines when that part of the system was built for clean ELECTRIC engines? ME MO not necessarily. Considering the price of diesel fluctuates it could be either or. 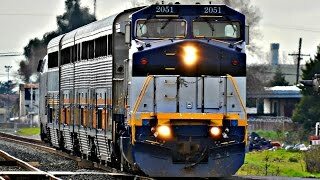 And considering diesel locomotives can only go so fast before they run out of fuel, where as long as there is electricity an electric locomotive can run for as long as needed. For major transportation routes like the keystone and northeast corridor it is more beneficial to use electric power. 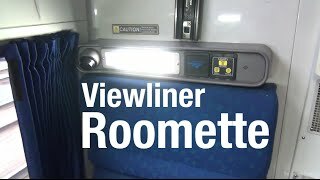 Now the only reason that dash 8's and other motive power is used on the keystone corridor that's non electric is because it saves time, they don't need to swap power. Sometimes what they will do though is use one of each. Say a P42 and an ACS64. They will use the P42 until they're 'under the wires' so to speak. Then they'll switch to the ACS64. So really the efficiency part is in the electric powered locomotives. rd3ster they were probably short in motive power. Which Is usually why it's there. Or if once it gets off the keystone where there no electrification they don't have to waste time with a power swap and just keep rolling. The Amtrak is the measuring part of the railroad tracks. The railroad tracks are kind of different then the difficult than amtrak trains. 1. Overpasses have weight restrictions and Underpasses have height restrictions, whereas grade crossings have NO restrictions. 2. Grade crossing elimination on the line causes road users to make unnecessary detours because the streets get "interrupted" by the crossings. Thus, road users are forced to travel out-of-their-way, hither and yon just to reach their final destination. 3. Overpasses and Underpasses can collapse easily, but crossings can't. Dante Trainmaster and people are impatient and go around the gates. It’s more health and safety. Hell the septa section of the keystone corridor is mostly underpasses and it works fine. And also another point I’d like to mention. Some railroad crossings do have restrictions. For larger trucks and low riding vehicles. Referring to your first point. Also referring to point 3. If built well they’ll last for a long time. +John McCardell That's why they are gated. Dante Trainmaster ah but if some dumbass runs the crossing (like what happened a few months ago where a tractor was struck by an Amtrak train) there's major discussions and rule changed. Overpasses and underpasses are better cause it avoids roads. The Dash 8s and AEM-7s are now a thing of the past. Great video! Especially the meet of the two Pennsylvanian's at the grade crossing!! Why do they sound their horns all the time? Nice! I caught one on the Lakeshore Limited yesterday! It's too bad they can't extend electrification to Pittsburg, then the Pennsylvanian could be electric all the way, and free up several diesels for other lines. I wish they electrify entirely to Pittsburgh and beyond. William Wadsworth That's what's left of PRR. Anthony Howard if they're slowing down (at the time of recording) it would either be for a railroad crossing or a curve. Now 80-90 is still pretty fast for a speed restriction. Phase IV Livery matches the amfleets like a charm. Amtrak actually owns the Keystone Corridor. They dispatch it from Wilmington, DE. Norfolk Southern has trackage rights in this case. 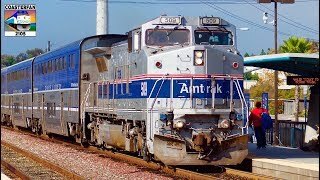 Amtrak doesn't own its own tracks, instead they use tracks owned by the Local Railroad companies; In this case, NS or CSX owns these tracks. 513 has a way better horn than 512! 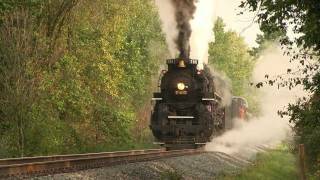 Saw 512 on the Pennsylvanian exactly 2 weeks ago. 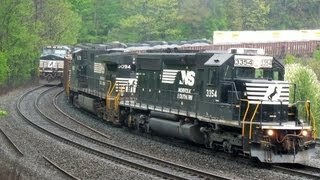 Norfolk Southern runs some local traffic along this line. 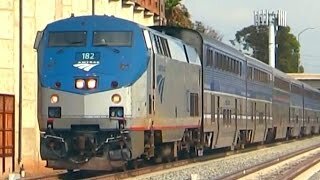 It's jointly owned, but Amtrak dispatches the route so they have priority over train movements. 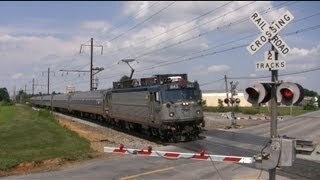 Is this line used only by Amtrak, or do they share it with a freight-carrying railroad like CSX or NS? Awesome video, by the way! 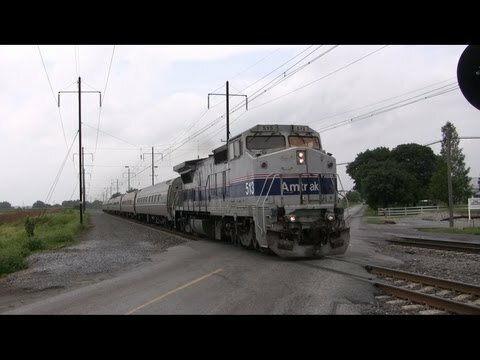 I just caught 512 on the Pennsylvanian about 2 weeks ago! [Rare!] 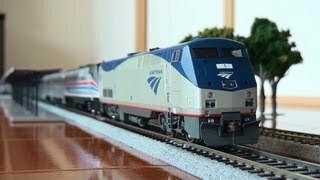 Dash 8-32BWH Leading Amtrak 91!!! 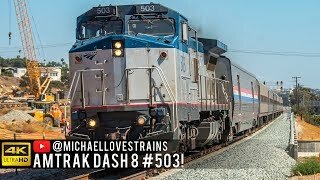 Amtrak Capitol Limited Montage - Plenty of K5LA!